A good compilation is sometimes all you need to open up a previously unexplored section of the music world; Various Artists are my favourite kind of artist. These compilations are like portals to an incredible 'elsewhere' – like opening a Pandora's Box, except with less of the world's evils and more of the world's good music. And besides, if Pokémon has proven anything, it's that we love collectibles – the mystique of Various Artists compilations hits us like the heady whiff of Nintendo's motley crew of monsters. That's not to reduce the ever-surprising V.A. down to a lower status – not at all. I love finding new things. And as such, this compilation (discovered thanks to LA producer Spazzkid) is a particularly special one. 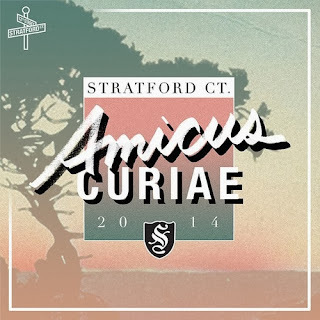 Now, talking about this whole thing – Amicus Curiae by fledgling collective/label Stratford CT. – would be ridiculous, so I'll start with the first track. It's by American producer sloslylove and it's called 'Ageless' and it's really nice. Taking cues from sunset-imbued 80s balladic pop, the track is a smooth escape into warmth and nostalgia, led by a cracking marvel of a bassline. A huge cradle of slapbass, thick and soulful, holds within it dreamy fragments of saxophone that lap at the edges of your mind's fondest memories whilst beautiful washes of soft synth watercolour the scene with twilit skies. You're struck by the timelessness of the song, its atmosphere pummelled gently by epic-inspired reverbing drums, slow and steady. It is indeed ageless. A sound to be lost in – an aid for unwinding – yet filled with heady romance on the cusp between action and fantasy. If you know what's good for you, and you wanna listen to some songs that have a similar vibe to this one, then please I do really urge you to check out Stratford CT.'s collection of curated tracks on Amicus Curae. You can also download it for free/name-your-price; definitely do this.